Sometimes, all your home needs to make a major transformation is a little bit of paint. Hiring residential painters to help you transform your home is a great way to give your space a makeover that you’ll love. Of the 1,700 subjects surveyed in 2014, more than one-third of them had hired a professional residential painter in the past year. Make the popular choice, and hire a painting service to help you with any of these fresh-paint projects. Fixtures - When your kitchen cabinets look like they’ve lived through the great depression, a new coat of paint may be just what you need to liven things up a bit. Your professional painters can help you find the perfect cabinet finishes for your kitchen, and can help you find the right wall color that will accent and highlight your beautiful “new” cabinets. Home interior - You want your home to represent your style, and if your style isn’t really exemplified by wallpaper from the 70s, you could probably use a fresh coat of paint. Interior painting can help to turn your living room from dark and dull to bright and colorful instantly. And you know that you won’t have any strange spots or sloppy edges when you rely on the expertise of a residential painter. 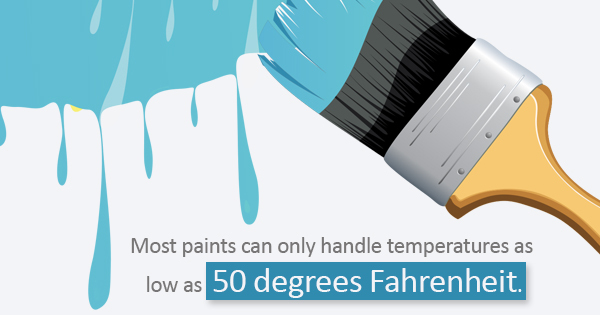 Make sure you consult your painter about the best conditions of care for the paint, since most paints can only handle temperatures as low as 50 degrees Fahrenheit. Home exterior - The first thing your house guests are going to see is your home’s exterior, so exterior painting is a great way to change your home’s look. Painting your home’s siding, or looking into fence painting, can help transform your home and yard. Consult your residential painter about choosing three different colors for your home’s exterior. Having one color for the body, one for the trim, and another for the doors and shutter will help to give your home a dynamic color scheme.